The New York Times reported on Aug 18, 1938, "Homicidal Henry or ‘Hammering Henry’, whichever you will, because he is a combination of both, won a 2-1 verdict from the bouts officials" in defeating Lou Ambers for the Lightweight title. The writer reported that he gave Armstrong 10 of the 15 rounds. It was the third divisional championship earned by Armstrong making him the only fighter in boxing history to hold three world titles simultaneously; featherweight, lightweight and welterweight. Armstrong was a marvel of the ring. He worked at a fast pace, had quick hands and unlike most fighters seemed to pick up speed as the rounds went on. He was also a strong puncher and defensively his bob and weave style kept him from receiving the full impact of his opponent’s blows. 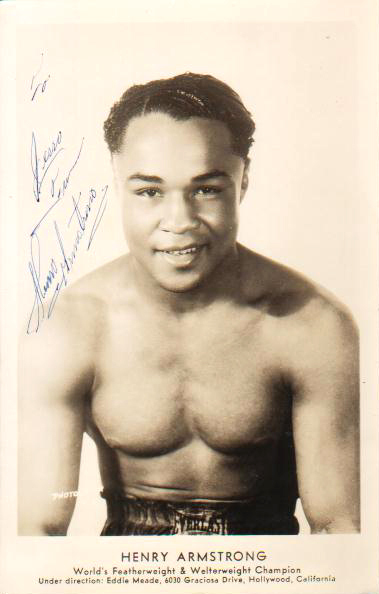 The truth of Henry Armstrong is that he had much better boxing skills than some give him credit for. Most fighters tried to run from Henry, but he never let them get away. He stuck to his opponent’s like superglue and drove them into a corner or trapped them against the ropes and them proceeded to give them a good pasting. Fighters who tried to stand their ground against Hank had difficulty keeping up with his work rate. He would overwhelm them until they were forced to back up and then he would chase them down, pounding away until they were beaten men. Upon his death it was discovered that Armstrong’s heart was a third larger than that of the average person. This allowed him to fight at a ferocious pace for 15 rounds without loss of breath. It seems certain that he could have done the same thing in a 20 round bout. Armstrong was a little ball of fire that ignited in the year 1937 winning 27 fights, that included the winning of the Featherweight championship by stopping Petey Sarron in 6 rounds. In 1938 he added the welterweight championship by decisioning Barney Ross and then added the lightweight title when he beat Lou Ambers over 15. Armstrong held three divisional titles simultaneously at a time when only eight titles existed, he might have won a fourth –giving him half of the championship titles of his day – if not for a dubious draw with reigning middleweight champion Ceferino Garcia. Armstrong’s peak run, as a professional was 46-0 with 39 knockouts. His overall record was 151-21-10 with 100 knockouts, although he had a number of “semi-pro” fights under the name of Melody Jackson that are unrecorded. McCallum claims an actual record of 261 fights. The Ring Magazine Aug. 1938, reported that "Armstrong’s feat is unique in boxing", in winning the featherweight, welterweight and lightweight championships in a span of 10 months. It was an unparalleled feat never duplicated before or after Armstrong’s remarkable year. He also defended the welterweight championship successfully 19 times in two years, which is a record for defenses at 147 pounds that stands to this time. Starting in 1940 the Armstrong engine started to lose steam and he began to slow down. Former heavyweight champion Jack Johnson was of the opinion, Ring, April 1941, that “nobody ever wasted energy like that boy. There is no way in the world he could have lasted any longer than he did fighting that way.” Bert Sugar seems to agree suggesting that Armstrong was burning out as early as the first Ambers fight. Armstrong was a star who burned brightly in a short span of time and then burnt out just as quickly. Towards the end as Armstrong was slowing down he became vulnerable to cuts around his eyes. 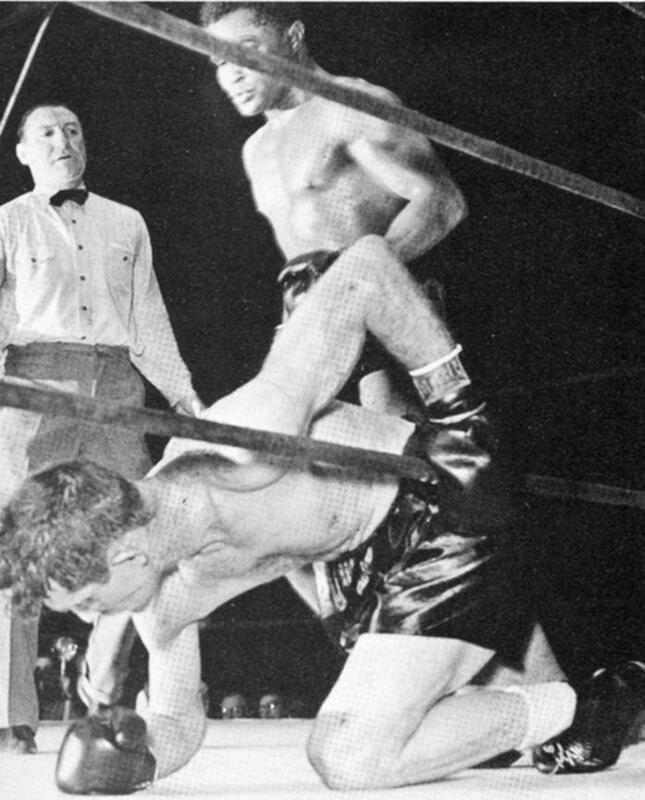 Armstrong finally lost his welterweight title to veteran brawler Fritzie Zivic, who was known as a dirty fighter. 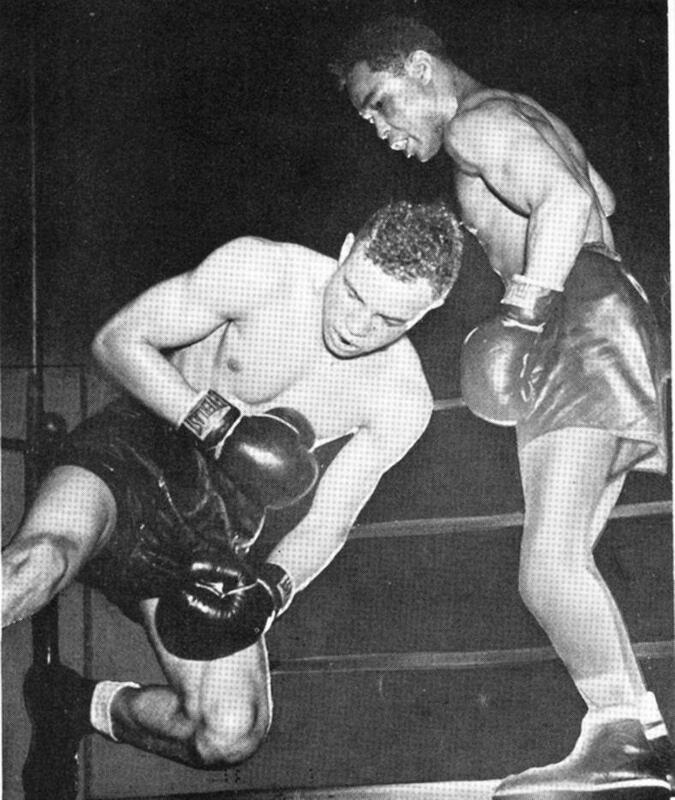 Zivic used every foul in the book and concentrated his attack on the vulnerable scar tissue around Armstrong’s eyes closing them in winning a 15 round decision. In the rematch Armstrong got the worse of it and again lost, in large part, due to cuts when he was stopped in 12 rounds. Armstrong won in a third meeting with Zivic although he was no longer the champion. Henry retired at the relatively young age of 32. He suffered from alcoholism in retirement but overcame it and became an ordained Baptist minister in 1951. He died nearly penniless at the age of 75 on Oct. 24, 1988 in Los Angeles. Armstrong’s greatness is confirmed by the fact that even the old timers of Armstrong’s day approved of his greatness. His all around endorsement is a testimony of what a great fighter he was. The following is taken from a Feb. 1938 Ring Magazine “Old Timers Compare ‘Em”, where veteran boxing watchers were asked to compare Armstrong to the great featherweights of the past. This was after Armstrong won the featherweight championship but before Armstrong made his great accomplishment of winning three titles at once. Professor Billy McCarney, an old time boxing instructor, chimed in that “McGovern was a head on fighter, with no defense to speak of, while Armstrong is really a hard fellow to get a good crack at because of his ability to slip blows that seem to be nailing him.” Going further McCarney believes that Armstrong would have won because McGovern might have punched himself out in an early round drive and then had nothing left if Armstrong withstood his opening blasts. Bert Sugar in his “100 Greatest Boxers of All Time” rated Henry Armstrong as the second greatest fighter in history behind Ray Robinson. The 2002 Ring Annual (Vol. 2) in the article “The 80 Best Fighters of the Last 80 Years” rated Armstrong second to Robinson. The 1996 Ring Almanac and Book of Facts rated Armstrong 1st at welterweight. William Detloff rated Armstrong # 4 all time greatest fighter in his article “The 20 Greatest Fighters of the 20th Century". Veterans Nat Fleischer and Charley Rose rated Armstrong in their top 10 at 147 pounds, although I believe his best weight was at 126. Historian Tracy Callis agrees rating Armstrong the # 1 all time featherweight. Cox’s Corner also rates Armstrong # 1 at featherweight. He would also rate as a top 5 lightweight and top 10 welterweight of all time. Armstrong easily ranks as one of the 10 greatest fighters of all time. Thanks to Dan Cuoco for providing the last 2 pictures.